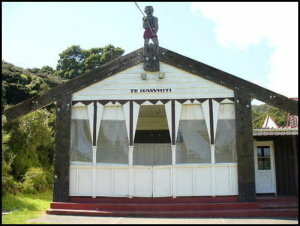 Te Rawhiti Marae is the ancestral Marae of the eastern Bay of Islands. The two major hapu of Te Rawhiti, Ngati Kuta and Patukeha, may be considered to own the Marae, but are, in truth, the kaitiaki (guardians), for generations of the past and those of the future. The Marae is a significant cultural site. At its core, it has the function of being a gathering place, providing a base to unite people, to inspire people, to give confidence to assist them to determine their lives productively. The Marae is used for a range of cultural purposes, the most significant of which is the tangihanga or funeral ceremonies. In the Te Rawhiti Marae Strategic Plan, the Marae is confirmed as an intrinsic part of the social and cultural fabric of the community. The strands of the fabric are more than its social and cultural aspects. With expanded vision, a number of pathways to progress the development of the community have been identified, educationally, environmentally and economically. In these future plans, the Marae remains central. The pathways define the potential in the community and the opportunities which offer fresh avenues, making the future an exciting prospect. Larger, renovated buildings will complement the expected activities. The upgrading and expansion of the Marae buildings have been planned for the last four years. The Marae was built in 1910 and major renovations were carried out between 1969 and 1974. Resource Consent for land use as a restricted discretionary activity has been gained. The next stage is applying for funding to begin the building plans and then construction.